The Hero Temple is for players level 40+ and can be accessed from the player's interface. 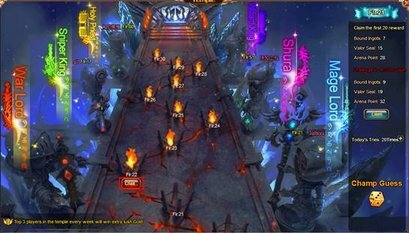 In this event players will be able to challenge and clear various floors of the instance. Players get up to 10 challenge attempts per day. Each floor tests the player's battle skills and rewards them. There are also 6 statues inside this instance, these statues will represent the 6 different classes and above each class statue it will display the top player in that class who has reached the highest floor in Hero Temple. There is even a betting feature that lets players bet on which of the players will be in the top 10 of a particular class for Hero Temple.